Today is the day!!! Decide to RISE UP. Everything you are looking for is on the other side of your fear, so rise up against your fear. When you Rise Up you make a declaration to yourself and the universe that you are in it to win it. Don’t worry about the results just do the work. If you Rise Up you will be shocked to realize how much strength you do have in you. 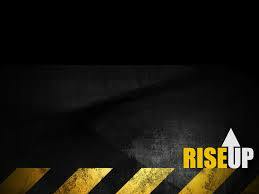 I don’t know if you have experienced anything yet that made you Rise UP but I challenge you to do it today.